Trust us when we say you are literally going to want to meet The Vamps by the time you're through giving their debut album a listen. The band, who got their start about a year and a half ago posting covers to YouTube, have successfully made the leap from covers to original songs with some of the catchiest songs that 2014 may see. Meet The Vamps is the epitome of sugary pop-rock, and it has been released just in time to make it a summer playlist must. Opening with their second single, ‘Wild Heart,’ the four Brits introduce themselves in a way that will certainly catch attention, and certainly the affections of teenaged girls around the world. Playing up the banjo infused pop that has become quite popular these days, the lead track is the perfect example of what listeners have ahead of them in this release. What lies ahead is an hour of music practically made for a day at the beach. Shortly following ‘Wild Heart’ is the lead single from the album, ‘Can We Dance.’ Co-written by Bruno Mars, it is certainly a standout. (Though, mind you, it is quite hard to choose a standout amongst the tracks given how good they all are.) With trumpet, a quick tempo and some slightly edgy lyrics given their fan base-- “I talk a lot of sh- when I’m drinking baby”-- if there is a song that’s going to get stuck in your head, this is the one. Another one of our favorite moments comes in the form of the sixth and seventh tracks, ‘Risk It All’ and ‘Oh Cecilia (Breaking My Heart)’ respectively. The prior is a big mid-tempo track that is reminiscent of Fun.’s ‘We Are Young’ and is also the first track to pull back on the reins a bit and break up the upbeat songs. Of course, it doesn’t last long before it slips into ‘Oh Cecilia (Breaking My Heart),’ a favorite because it samples Simon and Garfunkel’s ‘Cecilia.’ It’s within these two songs that we get a taste of the diversity of The Vamps’ influences, and for what it’s worth, we think it’s pretty damn cool, even if most listeners probably won’t get the reference in the latter. What's most notable about the debut release from the British quartet is its sincerity. Of the 15 tracks-- 18 if you have the deluxe edition - the boys have writing credits on 12 of them. (On the deluxe edition, they have 15 writing credits.) And it shows. Each song is fun, light, and nowhere near as serious as so many teenaged artists are shooting for now and days. They sing about having fun, not settling down for forever. They sing about just wanting to dance and even their songs about having their heartbroken and trying to get the girl back are upbeat. The only fault of Meet The Vamps, if we are forced to choose one, is that it does seem to be a bit on the long side. While every song is good, they could have managed to drop a few of the just good ones and kept all the great ones. We'll forgive them, though, because it's still going to be on repeat. 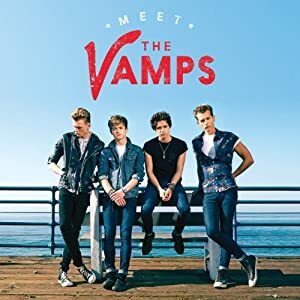 Meet The Vamps is available now in the United Kingdom via Virgin/EMI. A US release date is expected for later this year.